The Cleveland Police Department has one canine, or K-9, unit that works within the Patrol Division. Officer Mark Smith serves with his K-9 Razor. 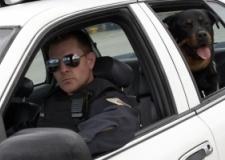 K-9s are trained in master protection, search, and drug search. Cleveland is proud to have these dedicated officers. For more information about the K-9 Unit, please contact us at (918) 358-3112.